What better way to relax with your family than by enjoying a sail aboard The Liberté? At the start of the new year, there are often many factors of stress following the holiday season. With the kids returning to school and everyone back in the office, now is the perfect time to dream about your relaxing escape for 2019. What better way to relax with your family than by enjoying a sail aboard The Liberté ? 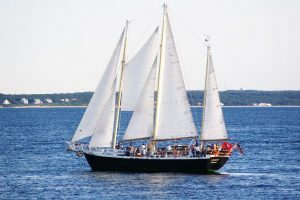 In scheduling a fun and exciting day sail for the spring, both your and your family can enjoy a fun, stress-free day in one of two beautiful coastal cities, Annapolis or Cape Cod! Even if your early spring ‘getaway’ only lasts for a day, a small break from the stresses of everyday life offers many benefits to your mental health as well! Consider how a relaxing day sail may be the best-kept secret for self-care in the new year! A day on the water will force you outside for a beautiful day while also providing you with a much-needed escape from your phone. Although your phone is essential for communicating each day throughout the year, it is also a significant source of stress in your everyday life! Escape overwhelming texts, calls, emails, and distracting social media posts to enjoy a beautiful spring day on the water with your family. As you are sailing aboard The Liberté with your friends and family, you can enjoy memorable, uninterrupted time with your favorite people. On a spring or summer day sail, you will enjoy laughing and making memories along scenic views of either Annapolis or Cape Cod. Make the most of photo-worthy views and relax with your friends and family on the water! Sailing is a perfect way to appreciate this stress-free day of fun together. It can be difficult to say ‘no’ to plans as overwhelming social obligations seem to pile up at the start of the year. With a day sail aboard The Liberté , you can escape from work and draining social commitments that otherwise leave you feeling stressed and overwhelmed. Treat yourself to a relaxing, stress-free day on the water so you can return to your life feeling rested and recharged. Not only will this relaxation ease your stress, but it will also help you to be more productive as you are working throughout the year. Plan Your Stress-Free Day with a Sail Aboard The Liberté! This entry was posted on Friday, January 25th, 2019 at 10:50 am. Both comments and pings are currently closed.